LA La Land: The Dorothy Chandler Pavilion is LA’s Lincoln Center Reviewed by Patrick O’Heffernan on February 20, 2019 . (Los Angeles) The Dorothy Chandler Pavilion is LA’s Lincoln Center. Part of the LA Music Center – one of the nation’s largest performing arts clusters- the DCP seats 3,156 people in four floors and features crystal chandeliers, wide curving stairways and rich, gold, brass, and glass décor. Opened in 1964 after 9 years of fundraising and wrangling, DCP is now home to the Los Angeles Philharmonic and it hosts traveling classical acts like the Shen Yun Dance from China and the Alvin Ailey Dance Group. However, if you stick around to 11:30 pm on special Saturday nights, the Philharmonic devotees are long gone, the doors reopen and Sleepless, the after-hours party starts. 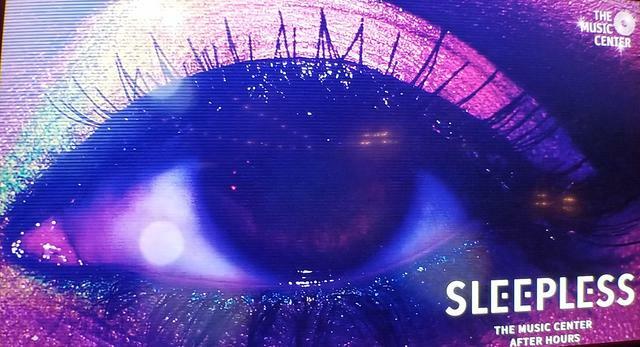 Sleepless is the Music Center ’s late night program aimed at the Red Bull generation. Last week’s Sleepless took on the time-honored Mexican tradition of fiesta de quince años or Quinceañera, the presenting of a family’s 15-year old daughter to the world as transitioning from childhood to womanhood (think debutant ball in Spanish). The custom is known through the Latin world and has evolved as it moved into the US where it is now major event keenly anticipated by teen Latinas and their families. It has also evolved into a celebration costing as much as $15,000, with professional photo shoots, caterers, elaborate dresses, fashionable shoes, and even party planners. And of course music, much of it traditional. There was a lot of music Saturday night at Sleepless, and some of it actually was traditional. As you walked into DCP’s soaring, gold trimmed and thickly carpeted lobby, you were met by Las Colibri, a female collective Mariachi in traditional Mexican dresses and wielding traditional Mariachi instruments. And they played traditional Mariachi favorites. But things really got going when the group broke into doo-wop songs, rock numbers and dance vibes. As the crowd around them grew the band formed a circle and individual singers stepped forward and serenaded the front row of admirers while cell phones snapped and videoed. Around the corner from the Mariachi, past the Sustainable Sparkle Bar where quinceañeras – or anyone – could get the makeup of their dreams – and the dance classes by Bachata/Salsa choreographer Leslie Ferreira helping fans design their own quinceañera moves was the Recuerdo Making Station by artist collective Ni Santas. Curated by Self Help Graphics, an LA-based activist art collective/gallery/print shop, it gave people an opportunity to make recuerdos – memories – honoring the many girls who are murdered in places like Juarez, Mexico, before they can celebrate their own 15th birthdays. 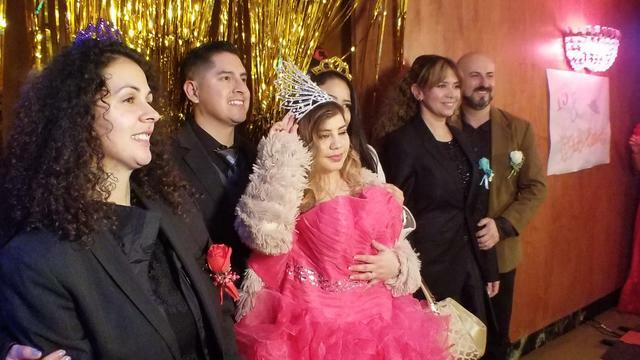 Participants were given miniature quinceañera high heeled shoes and the name and picture of a murdered a girl and guided in painting a likeness on the shoes as a keepsake of the evening. Past the pastelitos station with heart- covered chocolate cupcakes, were stairs to the second floor where the legendary Alice Bag was rocking the main stage. 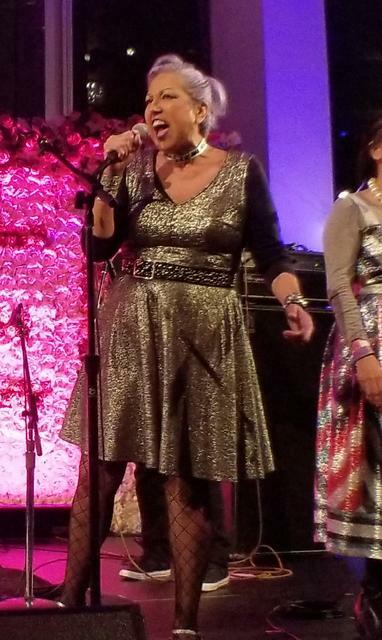 Musician, author, educator, and activist, Alice Bag (aka: Alicia “Alice” Armendariz, ) was a pioneer in the punk music movement as lead singer and co-founder of The Bags, one of the first wave of punk bands of the 70s in LA. Her first book, Violence Girl, From East LA Rage to Hollywood Stage, is the story of her upbringing in East Los Angeles, her eventual migration to Hollywood and the euphoria and aftermath of the first punk wave. A former bilingual elementary school teacher, she is a powerful force in the LA Latino fusion music scene. She released Alice Bag, her debut solo album in 2016 and a second solo album, Blueprint, last year. Resplendent in a gold quinceañera dress topped by day-glow blue hair, Alice kicked off the reimagining theme, delivering the message in music, lyrics and shout-outs that women of any age can achieve anything they want. Which was the theme of Quinceañera Reimagined. The night celebrated the power of women by honoring, celebrating and re-inventing a Latin custom rooted in marriageability, using its rituals and symbols but updating it for Latnix’s in today’s world – and poking a little fun at some of its excesses. As the female DJ collective Chulita Vinyl Club pulsed mixes through the Pavilion, a long line formed indicating that the Quincé Car Wash was up and running. A long hall in the DCP had been converted to an automated car wash-style instant quincenañera. Laughing groups came in, were greeted by a straight and gay hostess duo, bedecked with outrageous costumes and tiaras, moved to the next “wash station” where they were serenaded by a faux Latin rock star, guided into station 3 to be toasted with empty Champaign flutes and silly compliments, and then finally hurried to station 4 for a candid photo before being hustled out to make room for the next group. The highlight of the evening began around 1:30 am when Nancy Sanchez and her band appeared at the top steps of the long, glittering staircase that lead down to the main stage. Practically glowing in a multi-petticoat chiffon quinceañera dress, the lovely Sanchez floated down the stairs like a luminescent angel, making a queen’s entrance. Then she took the microphone and the reimagining began with a vengeance. Leading with “Eh Ah” from her American Nobio album, made even hotter by her trumpet and saxophone section, she moved through the album’s high energy songs and was then joined by Las Colibri Mariachi. They delivered 4 rollicking Mariachi tunes that were all impossible not to dance to. Just to make the point, Las Colibri came down off the stage, played their instruments on the dance floor and then put them aside to dance with the audience. Sanchez ratcheted up the dance energy when Leslie Ferreira brought her stunningly costumed Bachata Caliente Dance Team out to whirl and twirl through the audience, eventually pulling members into the dance as Sanchez sang her striking version of the 60’s slow dance hit “Angel Baby”. Sanchez closed her set by joining them and the rest of the moving throng on the floor for some old fashioned Texas Electric Slide line dancing. It was 3 am, the Pavilion was echoing with music, laughter and dancing feet and no one was sleepy. I like the reimagination of the Quinceñera.